You are here: Home / HEALTH / Would you want to try a broccoli latte? Would you want to try a broccoli latte? 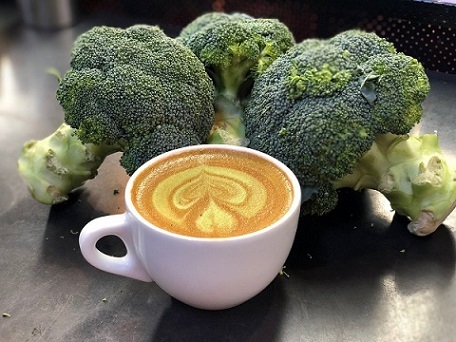 Australians love their morning coffee but one Melbourne café has brewed a broccoli latte with powder made from imperfect-looking broccoli, that would otherwise be thrown away. The powder, developed by Hort Innovation and CSIRO, is nutrient rich with approximately one serve of broccoli in every two tablespoons of powder. While a broccoli latte may not be to everyone’s taste, Hort Innovation chief executive John Lloyd said the powder could be used for smoothies, soups, baking and as a way of hiding broccoli from fussy kids in meals. Despite the increasing popularity of ‘superfoods’ and health and wellness, Australian diets are still poor. “Research shows the average Australian is still not eating the recommended daily intake of vegetables a day, and options such as broccoli powder will help address this,” Mr Lloyd said. The 100 per cent broccoli powder is made from whole broccoli and produced using a combination of selected pre-treatment and drying processes to retain the natural colour, flavour and nutrient composition of fresh broccoli. Lead researcher, CSIRO’s Mary Ann Augustin, said the broccoli was high in protein and fibre and health-promoting bioactive phytochemicals, making it an ideal candidate for powder development. The broccoli powder and associated extruded snacks, are being developed as part of a larger research and development project which aims to reduce vegetable waste by creating healthy food products from ‘ugly’ produce.